The video begins with an Overwatch player just finishing off a game and walking away from her PC, beside her are two Overwatch statues, one of Reaper and the other being Tracer. After the player leaves the room the Tracer statue comes to life, much like Toy Story. Tracer makes her way over to Reaper and asks "do you know what today is?" Reaper follows up with a very stern but not at all shocking "leave me alone." 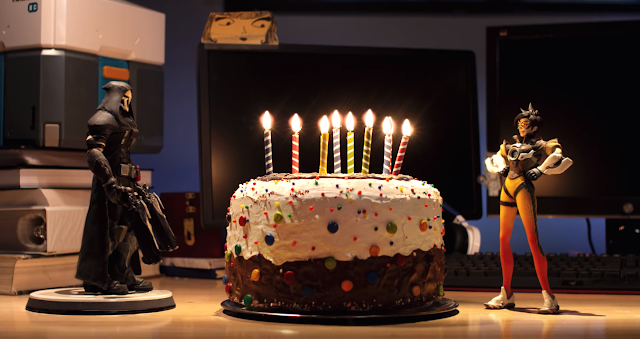 The stop-motion video continues by fans watching Tracer make a celebratory cake as fast as she possibly can, she finishes it up by getting Reaper to shoot the candles to light them, beginning the celebrations. For more information on Overwatch or if you are interested in joining the community visit the official Blizzard Entertainment website here. There is also a 'Behind the Scenes' to the "Trace & Bake" so if you want to know how the stop-motion video was made and how long it took check it out.